The Chicago Cubs and Cubs Charities teamed up with Urban Initiatives for a fun and exciting way to enjoy the summer days. The Cubs on the Move Fitness Trolley visited, Otis, Lloyd, Tarkington and Gunsaulus each week with one message, Play Every Day. Each visit began with a great warm-up led by volunteer trainers from Chicago Athletic Club. Once everyone was stretched and had their hearts pumping the Cubs trolley staff joined ran game stations and made sure each kid had fun and had plenty of physical activity. Running bases, tossing baseballs and relay races made each trolley visit so much fun for the kids. Once the game stations were wrapped up, the kids shared their fitness logs where they kept track of how much physical activity they did throughout the week. The Cubs Trolley team handed out Cubs hats, water bottles and even t-shirts to the campers with each completed log they turned in. 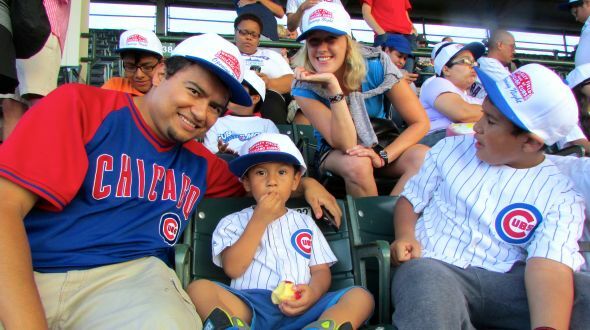 On Monday August 12th Urban Initiatives and the Cubs concluded their summer fitness initiative by bringing busloads of UI kids and their families, from Otis, Tarkington, Lloyd, and Gunsaulus, to a Cubs game where they took on the Cincinnati Reds. The Cubs and Cubs Charities were excellent hosts as kids and their families had the opportunity to enter through the VIP entrance and stand on the field to receive recognition for their commitment to fitness throughout the summer. Rows of smiling children gleefully held up their fitness logs and waived them in the air. Urban Initiative kids and their families were provided with a token of appreciation by each receiving a Cubs baseball cap before proceeding up the stairs to a section of seats especially designated to our enthusiastic bunch. The kids and their families all seemed to be very excited about the trip to Wrigley field and many families expressed their gratitude and their appreciation for the program. UI kids and their families along with the Urban Initiatives staff would like to thank the Chicago Cubs and Cubs Charities for their continued support and for giving everyone a memory that will last a lifetime.